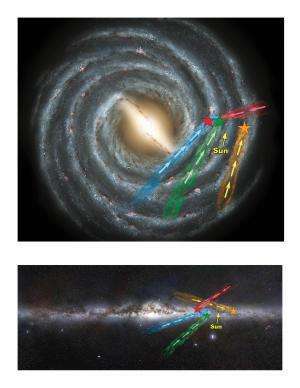 Top and side views of the Milky Way galaxy show the location of four of the new class of hypervelocity stars. These are sun-like stars that are moving at speeds of more than a million miles per hour relative to the galaxy: fast enough to escape its gravitational grasp. The general directions from which the stars have come are shown by the colored bands. Credit: Graphic design by Julie Turner, Vanderbilt University. The top view of the galaxy comes from the National Aeronautics and Space Administration and the side view comes from the European Southern Observatory. An international team of astronomers has discovered a surprising new class of "hypervelocity stars" – solitary stars moving fast enough to escape the gravitational grasp of the Milky Way galaxy. The discovery of this new set of "hypervelocity" stars was described at the annual meeting of the American Astronomical Society this week in Washington, D.C., and is published in the Jan. 1 issue of the Astrophysical Journal. "These new hypervelocity stars are very different from the ones that have been discovered previously," said Vanderbilt University graduate student Lauren Palladino, lead author on the study. "The original hypervelocity stars are large blue stars and appear to have originated from the galactic center. Our new stars are relatively small – about the size of the sun – and the surprising part is that none of them appear to come from the galactic core." The discovery came as Palladino, working under the supervision of Kelly Holley-Bockelmann, assistant professor of astronomy at Vanderbilt was mapping the Milky Way by calculating the orbits of Sun-like stars in the Sloan Digital Sky Survey, a massive census of the stars and galaxies in a region covering nearly one quarter of the sky. "It's very hard to kick a star out of the galaxy," said Holley-Bockelmann. "The most commonly accepted mechanism for doing so involves interacting with the supermassive black hole at the galactic core. That means when you trace the star back to its birthplace, it comes from the center of our galaxy. None of these hypervelocity stars come from the center, which implies that there is an unexpected new class of hypervelocity star, one with a different ejection mechanism." Astrophysicists calculate that a star must get a million-plus mile-per-hour kick relative to the motion of the galaxy to reach escape velocity. They also estimate that the Milky Way's central black hole has a mass equivalent to four million suns, large enough to produce a gravitational force strong enough to accelerate stars to hyper velocities. The typical scenario involves a binary pair of stars that get caught in the black hole's grip. As one of the stars spirals in toward the black hole, its companion is flung outward at a tremendous velocity. So far, 18 giant blue hypervelocity stars have been found that could have been produced by such a mechanism. Now Palladino and her colleagues have discovered an additional 20 sun-sized stars that they characterize as possible hypervelocity stars. "One caveat concerns the known errors in measuring stellar motions," she said. "To get the speed of a star, you have to measure the position really accurately over decades. If the position is measured badly a few times over that long time interval, it can seem to move a lot faster than it really does. We did several statistical tests to increase the accuracy of our estimates. So we think that, although some of our candidates may be flukes, the majority are real." The astronomers are following up with additional observations. The new rogues appear to have the same composition as normal disk stars, so the astronomers do not think that their birthplace was in the galaxy's central bulge, the halo that surrounds it, or in some other exotic place outside the galaxy. "The big question is: what boosted these stars up to such extreme velocities? We are working on that now," said Holley-Bockelmann. When the Milky Way collided and merged with the most recent of the smaller galaxies to have been swallowed by us (we might be "them"), there were likely millions, if not billions, of stars flung from the merging cluster. Those shock waves still remain and every once in a while, like a rogue on the ocean, a peak will come along that will flip a few spit balls into the captain's face. If the math doesn't work out on that I'll pay $100.00 to the first person to prove it -- you got PayPal? I'll do it today. Y'know what I don't like about "maths"? There isn't more than one. "...the Galactic Core is exploding. This news prompts the Puppeteer Exodus, where the Fleet of Worlds flee the galaxy at just under light speed for the Magellanic Clouds, in the hope that by the time the explosion reaches the Fleet of Worlds, the Puppeteers will have found a way to protect their civilization." Or that. That works for me. What's your pay pal? TheGhostofOtto1923, Nope! I think it's Galaxy Cup Soccer...or could it be Snooker? I seem to recall that some stars close the out edges could have v=250km/s so is it possible that some other grav attraction caused an acc, DM in the halo perhaps? As I understand physics, if a 'sling-shot' process is capable of such acceleration, then our 'galactic center' must be traveling at enormous speed: Eg, when we use this effect to accelerate or course-change an inter-planetary device, we see that as it approaches it's 'sling-shooter planet', it will accelerate , but then as it leaves that vicinity it will decelerate a corresponding amount. The final gain in velocity of the device is due to the fact that the planet itself has a velocity, part of which it can donate to the device's 'exit velocity.. It is hard for me to comprehend our SMBH at center of our galaxy traveling at such enormous speeds as over a million miles per hour.. The slingshot doesn't happen around the galactic center (you can't slingshot around the center of a system to get a speed boost within that system - no matter what Star Trek may have told you. In the movie they slingshot around the sun, which could give you a boost relative to galactic center - as the sun is in obit around that - but not relative to the sun). I.e. you can get a slingshot effect from something that is moving AROUND that center. That's why they need a binary star system for the scenario: The escaping hypervelocity star gets a kick from its companion's relative motion to the galactic center - which can be very fast when that binary system gets very close to the black hole. The velocity of the galactic center remains unaffected. If you study the escape velocity of ordinary stars, neutron stars, and stellar mass black holes, it is conceivable that the rogue stars could be ejected from a trinary star system or a globular cluster at such velocities, if it had a close encounter with one of the other stars at just the right approach conditions. It might be more complicated that than though. Perhaps it needs a two-stage boost, which might explain why these are so rare, or maybe they're everywhere and just haven't been noticed. It should rob angular momentum from the pair of stars which kicked it out, which should cause those to decay in orbit and collide, again unless the system is more complicated than that. Without knowing the initial parameters of such a system you couldn't predict whether that collision and potentially resulting Supernova has already happened, or whether it will happen some time in the future. "thrusting when near the Sun has the same effect as the powered slingshot... This has the potential to magnify a spacecraft's thrusting power enormously, but is limited by the spacecraft's ability to resist the heat... The additional energy imparted to the payload is exactly matched by a decrease in energy imparted to the propellant being expelled behind the rocket. This is because the velocity of the rocket is being subtracted from the propellant exhaust velocity. Since the ultimate fate of the propellant is not a concern, the fastest possible burn is usually the optimal procedure." -And there is the fact that the center of mass of Jupiter and the Sun lies above the Sun's surface at 1.068 solar radii from the Sun's center. So there is theoretically a way of gaining speed by using the sun, stimmt? You have no respect for google either? How sad. How annoying. "Interplanetary slingshots using the Sun itself are not possible because the Sun is at rest relative to the Solar System as a whole. -But as I pointed out the sun is not AT the center of the solar system so it ought to be possible to use it, although it might entail passing through the sun itself. Might work with a General Products hull. "The hulls are advertised as being capable of passing through the upper atmosphere of a star without damage, although the contents may become overcooked"